To answer a common question that seems to pop up quite often and without getting too technical, you’ll find that the thin nut is supposed to go on first and torqued to something less than full spec. The BIG nut then goes on and is brought up to full torque. That’s what the good engineering will say. BUT, from the practical standpoint (sometimes) and what seems to be done out in the field, it’s a different story. 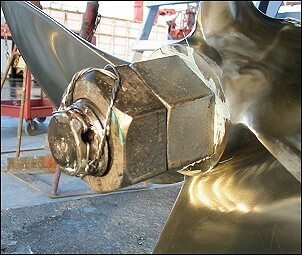 I think I could write a small book on proper propeller installation, as there are many principles involved that the typical “yard employee” doesn’t understand and, in the 20+ yrs I’ve dealt w/ shafts, props etc., I’ve run into some doozy examples of poor prop installation. I’ve seen more than one vibration problem solved when the key was properly re-fitted so the prop didn’t ride on it.. I’ve seen “hot props” put on only to see the prop not come off without pulling the shaft (or worse). A bronze prop that’s been laying in the sun ( a “hot prop”) may not come off when you need to pull it with normal methods. And, of course, I’ve seen many a prop come loose, only to lose it, and many a broken shaft, which I believe, in many cases, was due to the prop coming loose and working on the keyway. This has led me to develop my own protocol for installing props. Some readers may already know some of these suggestions, but I’ll go over the most important. First things first: The Keyway – On both the shaft and the propeller I always make sure there are no sharp corners or burrs. Although proper machining techniques would dictate a radius in the corners of the shaft keyway, this is not always the case. But, all keys do need a radius on all corners so as to prevent riding in the corner of the keyway. This is besides the grinding that may be necessary for a “slipper cut” key. Always be sure that the key you have selected slides easily through the propeller keyway and into the shaft keyway. Yes, there are some who think that it should be tight; I disagree 110%. Just about all new props require some light filing / deburring in the keyway so the key will slide smoothly with no binding. I normally use a good, single cut file to dress the keyways/edges and my belt sander to radius/grind key stock. As far as fitting the prop to the shaft, this should always be done BEFORE the key is used to ensure that the propeller and the taper are properly matched. A light spray of lubricant or smear of grease will allow you to install the prop and spin it on the shaft without the key to find out if there are any “catches.” Many times you’ll feel one keyway ride or catch on the other due to the imperfections of the machining. This is where lapping (filing) the two together will pay dividends. This can be done with standard light to medium grit valve grinding compound and only takes a few minutes to get a 95+% fit. It will also show you where your problem areas are. Larger props are sometimes undercut in the middle of the taper allowing only the small end of the taper and the large end of the taper to make contact with the shaft. After the prop goes on the shaft properly without the key, a small mark or reference should be made as to how far up the prop goes on the taper before the key is installed. This reference point will guide you when the key is finally fitted to be sure that the propeller is fully seated on the taper and not riding on the key. This is the most common mistake in prop installations that I have seen. As to the subject of lubrication between the prop key and taper, most yards seem to lean towards a “never-seize” type compound. Personally, I use a combination of Rector Seal #5 with a light spritz of WD-40. And, I use it liberally. Your choice on this, but the idea here is to fill any and all voids between the prop and shaft, allow the tapers to go together (slide) properly, thus keeping any crevice corrosion to a minimum. And, the only way you are going to get that NUT really tight, is to have a lubricant on the thread and in between the nut face and the prop. When it comes to the nuts and tightening, I’m sure only a few may agree with me. I know the yards frown on my technique. But here goes..(and I’ve been doing it successfully for years and years). After all the above has been accomplished (and it doesn’t really take very long unless we have a non-standard keyway), I always put the big nut on first with plenty of lubricant and sometimes a custom washer between the big nut and the prop. Depending on the shaft size, torque will vary from maybe 40-50-ft lbs on a 1″ shaft to 100++++ of ft-lbs on a 2-1/2″ shaft. Wait for 5 to 10 minutes after the first tightening to allow the excess lubricant to hydraulic out of the fitting between the prop / key / nut / shaft, etc. I then retighten the big nut again. Now comes my solution to prop nuts staying put, I clean the threads with spray brake-cleaner or whatever I have handy, smear a nice heavy dab of MarineTex or other common epoxy on the threads of the shaft (second nut only), and tighten up the small nut to something applicable to the shaft size. 3M 5200 or a similar high-strength urethane will also do an Okay job if it’s allowed to cure first. But, an epoxied nut “don’t go nowhere”, (until you want it to). And it does what it does quickly.. And then, when you remove it someday, it seems like the worlds best self-locking nut as it comes off. When I’m in the yard working on big shafts, I’ll sometimes use a propane torch to soften the epoxy/5200. Don’t forget, it’s not at all uncommon to warm a properly installed prop before you remove it anyway. Makes life easy most of the time. I’ve touched on a few points here. From doing this type of work for many years and also seeing (first hand) many problems resulting from the lack of understanding some simple concepts involved in the installation of propellers, I hope this will help some our readers. Big Nut or Little Nut first doesn’t seen to matter to me IF the prop is fitted properly and the NUT’s are tightened to spec. And with a little glue or safety wire, I never worry. P.S. A left hand prop is (usually) less likely to come loose than a right hand prop.. Ever wondered why? ?